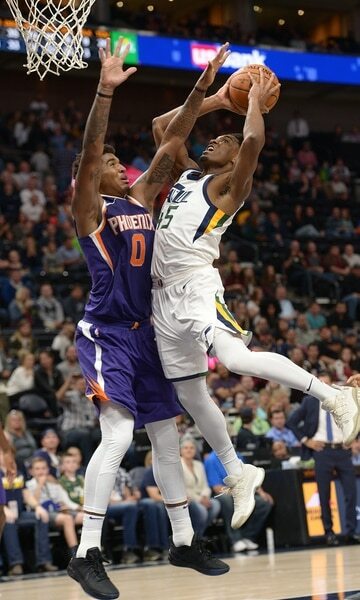 (Leah Hogsten | The Salt Lake Tribune) Utah Jazz guard Donovan Mitchell (45) rounds Phoenix Suns forward Marquese Chriss (0) to hit the net. The Utah Jazz defeated the Phoenix Suns 112-101 during preseason NBA basketball at Vivint Smart Home Arena in Salt Lake City, October 6, 2017. (Leah Hogsten | The Salt Lake Tribune) Utah Jazz guard Dante Exum (11) grimaces as he grabs his left shoulder after hitting the deck under the net as the Utah Jazz host the Phoenix Suns during preseason NBA basketball at Vivint Smart Home Arena in Salt Lake City, October 6, 2017. 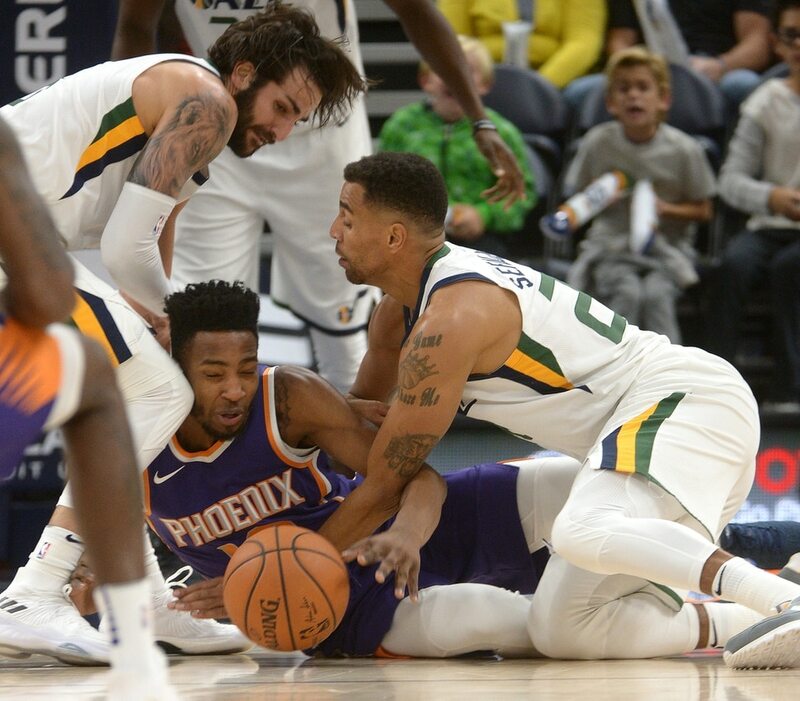 (Leah Hogsten | The Salt Lake Tribune) Utah Jazz guard Ricky Rubio (3) and Utah Jazz forward Thabo Sefolosha (22) pressure Phoenix Suns forward Derrick Jones Jr. (10) for the ball. The Utah Jazz defeated the Phoenix Suns 112-101 during preseason NBA basketball at Vivint Smart Home Arena in Salt Lake City, October 6, 2017. (Leah Hogsten | The Salt Lake Tribune) Utah Jazz forward Derrick Favors (15) blocks Phoenix Suns forward Dragan Bender (35). The Utah Jazz defeated the Phoenix Suns 112-101 during preseason NBA basketball at Vivint Smart Home Arena in Salt Lake City, October 6, 2017. (Leah Hogsten | The Salt Lake Tribune) Phoenix Suns guard Tyler Ulis (8) picks up the arm of Utah Jazz guard Ricky Rubio (3). The Utah Jazz defeated the Phoenix Suns 112-101 during preseason NBA basketball at Vivint Smart Home Arena in Salt Lake City, October 6, 2017. (Leah Hogsten | The Salt Lake Tribune) Utah Jazz guard Donovan Mitchell (45) fights for the rebound under the net. The Utah Jazz defeated the Phoenix Suns 112-101 during preseason NBA basketball at Vivint Smart Home Arena in Salt Lake City, October 6, 2017. (Leah Hogsten | The Salt Lake Tribune) Utah Jazz forward Thabo Sefolosha (22). The Utah Jazz defeated the Phoenix Suns 112-101 during preseason NBA basketball at Vivint Smart Home Arena in Salt Lake City, October 6, 2017. (Leah Hogsten | The Salt Lake Tribune) Utah Jazz forward Ekpe Udoh (33) stops Phoenix Suns guard Tyler Ulis (8). The Utah Jazz defeated the Phoenix Suns 112-101 during preseason NBA basketball at Vivint Smart Home Arena in Salt Lake City, October 6, 2017. (Leah Hogsten | The Salt Lake Tribune) Utah Jazz forward Thabo Sefolosha (22) rounds Phoenix Suns center Alex Len (21) on his way to the net. The Utah Jazz defeated the Phoenix Suns 112-101 during preseason NBA basketball at Vivint Smart Home Arena in Salt Lake City, October 6, 2017. (Leah Hogsten | The Salt Lake Tribune) Utah Jazz guard Ricky Rubio (3) favors his left knee after hitting the deck for a loose ball. The Utah Jazz defeated the Phoenix Suns 112-101 during preseason NBA basketball at Vivint Smart Home Arena in Salt Lake City, October 6, 2017. (Leah Hogsten | The Salt Lake Tribune) Utah Jazz guard Donovan Mitchell (45). The Utah Jazz defeated the Phoenix Suns 112-101 during preseason NBA basketball at Vivint Smart Home Arena in Salt Lake City, October 6, 2017. (Leah Hogsten | The Salt Lake Tribune) Utah Jazz guard Donovan Mitchell (45) directs the play. The Utah Jazz defeated the Phoenix Suns 112-101 during preseason NBA basketball at Vivint Smart Home Arena in Salt Lake City, October 6, 2017. (Leah Hogsten | The Salt Lake Tribune) Utah Jazz forward Ekpe Udoh (33) shuts down Phoenix Suns guard Troy Daniels (30). The Utah Jazz defeated the Phoenix Suns 112-101 during preseason NBA basketball at Vivint Smart Home Arena in Salt Lake City, October 6, 2017. (Leah Hogsten | The Salt Lake Tribune) Utah Jazz guard Alec Burks (10) tries to get past Phoenix Suns forward Marquese Chriss (0). The Utah Jazz defeated the Phoenix Suns 112-101 during preseason NBA basketball at Vivint Smart Home Arena in Salt Lake City, October 6, 2017. (Leah Hogsten | The Salt Lake Tribune) The Utah Jazz defeated the Phoenix Suns 112-101 during preseason NBA basketball at Vivint Smart Home Arena in Salt Lake City, October 6, 2017. (Leah Hogsten | The Salt Lake Tribune) Utah Jazz guard Dante Exum (11) grimaces as he grabs his left shoulder after hitting the deck under the net as the Utah Jazz host the Phoenix Suns during preseason NBA basketball at Vivint Smart Home Arena in Salt Lake City, October 6, 2017. (Leah Hogsten | The Salt Lake Tribune) Utah Jazz guard Alec Burks (10) skies to the net for a dunk as the Utah Jazz host the Phoenix Suns during preseason NBA basketball at Vivint Smart Home Arena in Salt Lake City, October 6, 2017. (Leah Hogsten | The Salt Lake Tribune) Utah Jazz guard Dante Exum (11) runs off the court holding his left shoulder after hitting the deck in the first half as the Utah Jazz host the Phoenix Suns during preseason NBA basketball at Vivint Smart Home Arena in Salt Lake City, October 6, 2017. (Leah Hogsten | The Salt Lake Tribune) Utah Jazz guard Alec Burks (10) makes a dunk as the Utah Jazz host the Phoenix Suns during preseason NBA basketball at Vivint Smart Home Arena in Salt Lake City, October 6, 2017. (Leah Hogsten | The Salt Lake Tribune) Utah Jazz guard Donovan Mitchell (45) battles Phoenix as the Utah Jazz host the Phoenix Suns during preseason NBA basketball at Vivint Smart Home Arena in Salt Lake City, October 6, 2017. (Leah Hogsten | The Salt Lake Tribune) Phoenix Suns forward T.J. Warren (12) leaves the game holding the back of his head in the first half as the Utah Jazz host the Phoenix Suns during preseason NBA basketball at Vivint Smart Home Arena in Salt Lake City, October 6, 2017. (Leah Hogsten | The Salt Lake Tribune) Utah Jazz center Rudy Gobert (27) is fouled under the net by Phoenix Suns forward Anthony Bennett (23) as the Utah Jazz host the Phoenix Suns during preseason NBA basketball at Vivint Smart Home Arena in Salt Lake City, October 6, 2017. (Leah Hogsten | The Salt Lake Tribune) Utah Jazz guard Dante Exum (11) fights past Phoenix Suns forward Marquese Chriss (0). The Utah Jazz defeated the Phoenix Suns 112-101 during preseason NBA basketball at Vivint Smart Home Arena in Salt Lake City, October 6, 2017. (Leah Hogsten | The Salt Lake Tribune) Utah Jazz guard Dante Exum (11) flies high to catch a pass. The Utah Jazz defeated the Phoenix Suns 112-101 during preseason NBA basketball at Vivint Smart Home Arena in Salt Lake City, October 6, 2017. (Leah Hogsten | The Salt Lake Tribune) Utah Jazz forward Derrick Favors (15) shoots around Phoenix Suns forward Marquese Chriss (0). The Utah Jazz defeated the Phoenix Suns 112-101 during preseason NBA basketball at Vivint Smart Home Arena in Salt Lake City, October 6, 2017. (Leah Hogsten | The Salt Lake Tribune) Utah Jazz center Rudy Gobert (27) fights Phoenix Suns forward Marquese Chriss (0) under the net. The Utah Jazz defeated the Phoenix Suns 112-101 during preseason NBA basketball at Vivint Smart Home Arena in Salt Lake City, October 6, 2017. (Leah Hogsten | The Salt Lake Tribune) Utah Jazz guard Ricky Rubio (3). The Utah Jazz defeated the Phoenix Suns 112-101 during preseason NBA basketball at Vivint Smart Home Arena in Salt Lake City, October 6, 2017. (Leah Hogsten | The Salt Lake Tribune) Utah Jazz guard Ricky Rubio (3) collides with Phoenix Suns guard Tyler Ulis (8). The Utah Jazz defeated the Phoenix Suns 112-101 during preseason NBA basketball at Vivint Smart Home Arena in Salt Lake City, October 6, 2017. (Leah Hogsten | The Salt Lake Tribune) Utah Jazz guard Rodney Hood (5) shoots over the Phoenix defense. The Utah Jazz defeated the Phoenix Suns 112-101 during preseason NBA basketball at Vivint Smart Home Arena in Salt Lake City, October 6, 2017. (Leah Hogsten | The Salt Lake Tribune) Utah Jazz guard Ricky Rubio (3) takes the floor and thanks the crowd prior to the game. The Utah Jazz defeated the Phoenix Suns 112-101 during preseason NBA basketball at Vivint Smart Home Arena in Salt Lake City, October 6, 2017. (Leah Hogsten | The Salt Lake Tribune) Utah Jazz forward Joe Ingles (2) pressures Phoenix Suns forward Josh Jackson (20). The Utah Jazz defeated the Phoenix Suns 112-101 during preseason NBA basketball at Vivint Smart Home Arena in Salt Lake City, October 6, 2017. (Leah Hogsten | The Salt Lake Tribune) Utah Jazz head coach Quin Snyder talks with Utah Jazz guard Ricky Rubio (3) and Utah Jazz forward Joe Ingles (2). The Utah Jazz defeated the Phoenix Suns 112-101 during preseason NBA basketball at Vivint Smart Home Arena in Salt Lake City, October 6, 2017. (Leah Hogsten | The Salt Lake Tribune) Phoenix Suns assistant coach and former Jazz head coach Tyrone Corbin. The Utah Jazz defeated the Phoenix Suns 112-101 during preseason NBA basketball at Vivint Smart Home Arena in Salt Lake City, October 6, 2017. (Leah Hogsten | The Salt Lake Tribune) Utah Jazz guard Ricky Rubio (3) takes direction from Utah Jazz head coach Quin Snyder. The Utah Jazz defeated the Phoenix Suns 112-101 during preseason NBA basketball at Vivint Smart Home Arena in Salt Lake City, October 6, 2017. (Leah Hogsten | The Salt Lake Tribune) Utah Jazz guard Ricky Rubio (3) tangles with Phoenix Suns guard Devin Booker (1). The Utah Jazz defeated the Phoenix Suns 112-101 during preseason NBA basketball at Vivint Smart Home Arena in Salt Lake City, October 6, 2017. (Leah Hogsten | The Salt Lake Tribune) Utah Jazz guard Ricky Rubio (3). The Utah Jazz defeated the Phoenix Suns 112-101 during preseason NBA basketball at Vivint Smart Home Arena in Salt Lake City, October 6, 2017. (Leah Hogsten | The Salt Lake Tribune) Phoenix Suns head coach and former Utah Jazz player Earl Watson directs players during the first half. The Utah Jazz defeated the Phoenix Suns 112-101 during preseason NBA basketball at Vivint Smart Home Arena in Salt Lake City, October 6, 2017. (Leah Hogsten | The Salt Lake Tribune) Utah Jazz head coach Quin Snyder looks to Utah Jazz guard Dante Exum (11) as he heads into the game in the first quarter. The Utah Jazz defeated the Phoenix Suns 112-101 during preseason NBA basketball at Vivint Smart Home Arena in Salt Lake City, October 6, 2017. The Utah Jazz established command early against the Phoenix Suns on Friday night, let the lead slip in the third quarter and held on at the end to win 112-101. But no one with the Jazz or the team’s fan base cared about the final score after what happened to Dante Exum. The fourth-year point guard drove to the basket late in the first quarter, collided with Suns forward TJ Warren and crashed to the floor. 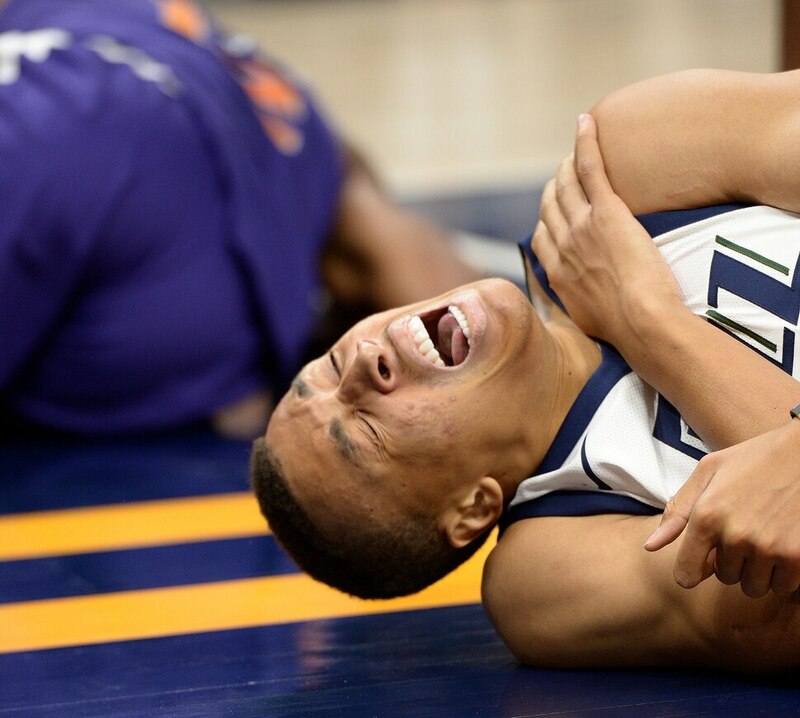 Exum rolled around in obvious pain, rose to his feet and sprinted to the locker room with what looked like a dislocated shoulder. The Jazz officially labeled it a left shoulder injury and Exum didn’t return to the game. He was undergoing an MRI on Friday night to determine the exent of the injury, and Utah coach Quin Snyder didn’t sound optimistic. Exum, even in the short sample size of the preseason, looked like the game was finally slowing down for him. Through three preseason games, he’s looked dynamic on both sides of the floor and more like the player the Jazz thought he would be when they took him with the fifth pick of the 2014 NBA draft. Teammates afterward said they feel empathy for Exum, who’s already suffered one major injury in his career with a torn ACL the summer after his rookie season. He worked hard during this past offseason to improve, and was in line for heavy rotation minutes off the bench in reserve of Ricky Rubio. If Exum is forced to miss major time, the Jazz will have to adjust their rotation. The immediate benefactor would appear to be shooting guard Alec Burks, who scored a game-high 19 points against Phoenix on Friday. Raul Neto would probably see an increased role as well. The question would be whether rookie Donovan Mitchell is able to slide over and play some minutes at point guard whenever Ricky Rubio goes to the bench. That would allow Snyder to play Burks more at the shooting guard spot, where he has been dynamic in the preseason. The Jazz put six players in double-figures, with Rodney Hood scoring 19 to go along with Burks. Favors and Joel Bolomboy scored 12 points, while Joe Johnson and Ricky Rubio scored 11 each. The Suns were led by Troy Daniels and Alex Len, who scored 18 points. The Jazz and the Suns play again on Monday in Phoenix.